Hypoglycemia is a common condition in which blood sugar levels fall below normal levels. Most often a side-effect of diabetes medication, symptoms range in severity from clumsiness and confusion... to death. Sugar levels frequently change throughout the day and may be normal sometimes and abnormal at others. Falling asleep after a meal (a "food coma") is quite normal and doesn't necessarily mean you have hypoglycemia. Fasting hypoglycemia (also known as absolute hypoglycemia) is the most common type and can occur after a long period without food, or after strenuous exercise. Reactive hypoglycemia (also called postprandial hypoglycemia) occurs after meals. However, just because a person becomes tired after eating doesn't mean there is a problem: in general, a little bit of sleepiness after eating is completely normal and nothing to worry about. Alimentary or gastric surgery leading to rapid stomach emptying or "dumping syndrome" in about 15% of cases. Two factors can lead to sugar overload: An overconsumption of sugar and a problem with sugar metabolism. Over-consumption of sugar begins at an early age – just check out the sugar levels in the most popular children's cereals. You will find that many contain almost 50% of their calories as sugar. Sugar is addictive, and difficult to avoid because it is added to almost every packaged food sold today. Hypoglycemia is a general term used to describe a mixed bag of symptoms that are due to a derangement of glucose metabolism. Under the strict medical definition, hypoglycemia mainly refers to a drop in fasting blood sugar below 50mg% (normal range 70-90mg%). This drop can be associated with differing symptoms depending on the rate at which the blood sugar falls. Symptoms typically appear quickly and include clumsiness, confusion, difficulty speaking, weakness, shakiness, excess hunger, anxiety, outbursts, faintness, headaches, passing out, delirium, coma, hallucinations, excess sweating, the appearance of intoxication, seizures, marked personality changes, irritability, negativism, mood swings, depression, crying spells, and various similar mental symptoms. 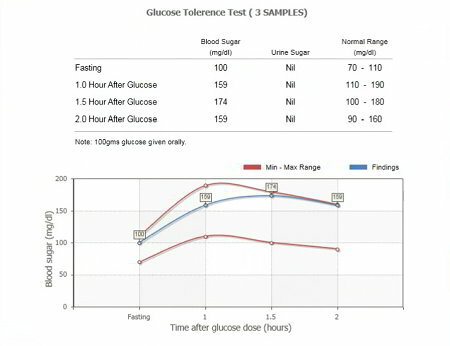 Results from a 2-hour Glucose Tolerance Test (GTT) showing minimum-maximum range in red and actual readings in blue. A Glucose Tolerance Test (ideally lasting 5-6 hours) can confirm a diagnosis, but more alternative doctors are forgoing the inconvenience and shock to the system because symptoms alone are reliable enough. Central nervous system changes, adrenal hormone output and detoxification (what the body tries to do when it is not busy digesting food) also contribute to the overall symptom picture. This type results in a rapid rise in blood glucose within the first hour followed by a pronounced or precipitous drop in blood glucose in the second hour. Symptoms of this type of response are rapid mood swings, volatile personality, erratic behavior before and after eating. Possible cause of this response is gastric dumping, too large an insulin response (pancreatic problems) and glucose tolerance factor problems (liver problems). After ingestion of glucose the blood sugar rises for the first three hours followed by a hypoglycemic rebound at 4 to 6 hours. Symptoms associated with this type of response are tiredness 2 hours after eating, allergic responses or food intolerances, and shakiness before meals. When blood sugar falls rapidly, the early symptoms are those brought on by a compensating secretion of adrenalin; these include sweating, weakness, hunger, racing pulse and an "inner trembling". This response can be due to adrenal cortical insufficiency or thyroid deficiency. In this case the blood glucose does not deviate more than +/- 15% from fasting level through the whole test. Symptoms that may appear are fatigue, apathy or hypotonia (poor muscle tone). These symptoms are due to poor digestion and absorption of nutrients. The term "hypoglycemia" may be better named "carbohydrate intolerance syndrome" and treated accordingly. Patients with hypoglycemia of varying causes appear to show similar personality patterns, suggesting hypoglycemia can cause personality disorders. Hunger is a symptom of hypoglycemia. Blurred vision and diplopia (double-vision) are possible symptoms. Skipping a meal causes blood sugar levels to drop, triggering a release of hormones that compensate for low glucose levels. These can narrow the arteries, increase blood pressure, and result in headaches or migraines. Low blood sugar also leads to fatigue and the feeling of weakness. Uncontrolled rage is a possible symptom. When the brain senses low glucose levels, it will employ various mechanisms to try and rectify the situation. One way is by releasing adrenaline, which can cause vivid dreams that are accompanied by a feeling of being "wired" (nervous, tense, on edge, highly stimulated). Insulin levels may play a significant role in determining how much DHEA is metabolized. Studies have discovered that low levels of DHEA may be related to an excess of insulin. What this suggests is that anyone suffering from hypoglycemia or excess insulin may be prone to converting nutrients to fat due to depressed DHEA levels. Dizziness and fainting spells are a possible symptoms of hypoglycemia, which may in turn be a reaction to insulin. As hypoglycemia progresses a variety of symptoms can occur including muscle twitching. Amongst 300 patients in one study (185 female, 115 male) found to have relative hypoglycemia (a drop of 20% or more below the fasting blood sugar level during a 6-hour glucose tolerance test), 23% had muscular twitching or cramps. Patients suffering with Wilson's Syndrome, a form of hypothyroidism, occasionally experience intense and previously unfamiliar cravings for sweets. The low body temperature patterns may affect the function of enzymes involved in glucose metabolism that could result in lower blood sugar levels which might contribute to sweet cravings. Endogenous depression – depression originating from within as opposed to being due to external factors – is a known symptom. Temporary forgetfulness is a known symptom of hypoglycemia. Nighttime hypoglycemia may be without symptoms or manifest itself as night sweats, unpleasant dreams or early morning headache. Numerous patients given psychiatric diagnoses have actually turned out to have hypoglycemia, including those classified with depression, manic-depressive disorder, and schizophrenia. For additional reading from a sufferer's perspective, you could read the book The Low Blood Sugar Handbook: You Don't Have to Suffer... by Edward A. Krimmel, Patricia T. Krimmel. It is not a dry technical book, but one that you should enjoy while helping you resolve the problem. If you must use sweeteners, stevia is an excellent natural alternative to simple sugars and unhealthy chemical alternatives. Consuming foods that contain simple sugars makes the problem worse. Avoid sweets other than fresh fruits, if tolerated. In addition, consider avoiding products that only "taste" sweet (artificially sweetened – low calorie). Even though they may contain no sugar, sending signals to your brain that something "sweet" is being consumed may have negative consequences. Refined carbohydrates are more readily absorbed than unrefined, and should be avoided in those with any glucose intolerance. Frequent small meals are more effective in stabilizing blood sugar levels than large, less frequent ones. Remember to consume something before symptoms appear. Protein snacks that keep well should be stored in locations such that you always have quick access to food. You may find it helpful to store protein bars or nuts in your car, at work, in your pockets or (for women) in your purse. A diet consisting of higher protein and fat with less refined carbohydrates is a standard recommendation for those with hypoglycemia. Avoid all soft drinks, coffee, tea, artificial colors and additives. Drinking alcohol can cause blood sugar to drop in some sensitive individuals. Hypoglycemia has been well documented in chronic alcoholics and binge drinkers. In severe cases, additional methods of support besides diet may be needed and perhaps the best of these is fasting. Fasting is a useful, inexpensive and universally available treatment for hypoglycemia. The fast allows the entire system to restore its cellular integrity. Fruit contains several things that are of benefit, including a sugar (fructose) that does not cause wild glucose swings, trace minerals, and fiber which slows glucose absorption. Moderate exercise improves glucose metabolism. Those few individuals who find that strenuous or prolonged exercise causes hypoglycemia should take food at the earliest opportunity. Chromium status should be optimized for its benefit in carbohydrate disorders (both hypoglycemia and adult-onset diabetes).